I picked up this book because I’ve been following Sasha’s Youtube videos for a while now and I really admire her, especially when I heard she was co-writing a book with Lindsay Cummings. I have not yet read anything by Lindsay Cummings, but The Murder Complex is definitely on my TBR. Anyway, I also picked this up simply because the synopsis intrigued me. A kickass female main character, an all-female crew and space pirates antics? Yes, please! And I ended up really enjoying this one. There may be a few issues here and there, but I feel most of those are simply due to the fact that it is being released in small parts. I’ll get into that in a minute, but I first want to say that what matters most to me is how I felt at the end of this first part, and that was… I NEED MORE NOW. The story is fun and quick (I think overall reading time was about an hour) and gets you hooked rather quickly. I’ll definitely pick up part two as soon as possible! Our main character Androma (also known as the Bloody Baroness. Or you know, Andi works too) is pretty badass and powerful, but haunted by her past. She’s a multidimensional character that I’m really looking forward to getting to know more about. I did feel like her tragic backstory was revealed perhaps a bit too soon, but I’m sure there’s more to the story still that we’ll find out later. And I personally did not get a Celaena-Sardothien-in-space vibe from her. Not every badass female assassin/space pirate with a haunted past is Celaena Sardothien, guys. Though there may be some similarities now, it’s only the very beginning, so give her some more time to become her own kickass character. The other characters intrigued me, but I did not yet have the time to become attached to them. That’s purely because it’s a short story though and has nothing to do with writing or character development. I’m still a bit wary about Dex, the bounty hunter/mentor who trained Andi to become her own badass self. I’m still witholding judgment on him for now because I want to like him, but I don’t trust him one bit. I liked Andi’s crew as well, but again I just did not yet have any big feelings about them. They were all nicely introduced and are their own distinct person, but I don’t care that much about them yet. But again, I’m sure it will happen in part two. I really did enjoy the writing. For a co-written story, I thought it flowed nicely, it felt like it was written by one person and it managed to hook me from the beginning. There were a few bits which were a bit infodumpy and harder to swallow, but those were few in the overall picture, so I’m okay with it. Overall, this part nicely set up what I’m sure will be an epic story. All the players are introduced and set in place, ready to go on a space adventure, and I can’t wait for part two so I can join them for the ride! Every shade was unique in Valen’s eyes. “Each line she etched into the metal was another life cut off, another heart stopped at the slice of this very blade. “Androma was good at what she did. But so was Dex. “He wondered, as her blades crackled in the too quiet room, and waves of electricity spiraled around them, if he’d made a mistake. He hadn’t seen her in years, but he’d heard the rumors. He hadn’t truly known if she could wield those weapons with the glory and grace that drew blood and split bones. But now, as Androma hissed, “I’m going to kill you,” and her words sent a slice of fear charging through Dex’s heart, he knew. Gone was the girl he’d once known, that shivering thing he’d found bruised and broken in the wilderness of Adhira. 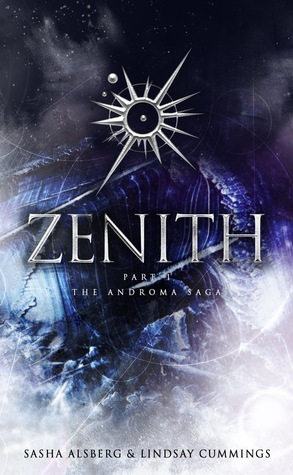 Have you read Zenith part one? What did you think ABOUT IT?